Most of them are obituaries from all the broadsheet press dated April 20th 1989, the day after she died. There are also articles such as ‘Secret jealousy of the real Rebecca’ from the Observer on Sunday the 23rd of April 1989, ‘Estuary is a model for saving species’ from The Guardian June 8th 1996 which is all about ‘Frenchman’s Creek’, ‘Cornwall: A Tip of a Landscape’ which is a colour supplement from 1985 celebrating ‘Vanishing Cornwall’ as a book itself two decades on. 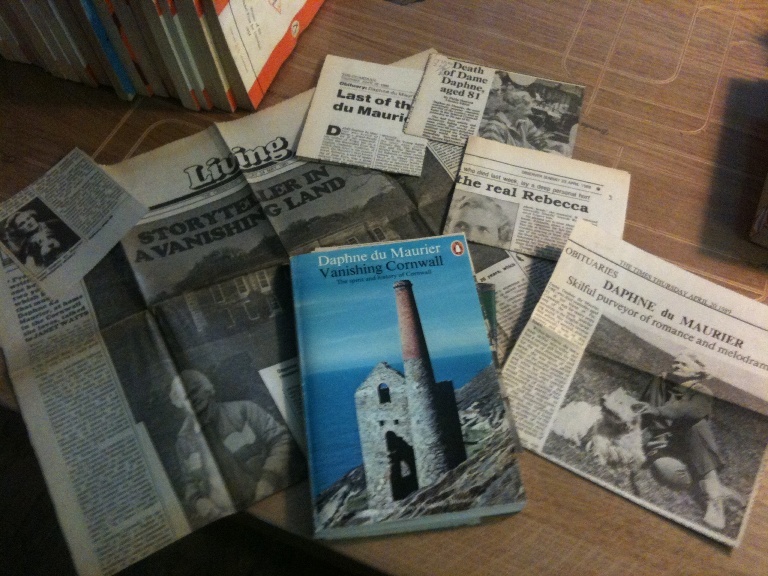 My very favourite find though was ‘A Storyteller in a Vanishing Land’ from Living which is a huge piece on Du Maurier’s home Menabilly from 24th of May 1981… the article itself is older than me. Don’t you find that fascinating? What more of a sign could I have that doing ‘Discovering Daphne’ was meant to be? Sometimes I really do think you are meant to be in a certain place at a certain time and in this case I was meant to find this book and all it had in it. We can gloss over the other articles the reader had kept about the sale of a Victorian taxidermy museum can’t we? So I wondered have you ever found a book that you have been searching for ages, or didn’t even know you were searching for, and its suddenly there in front of you when you least expect it? What joyful things have you found in a book? What do you think of my find, is it fate?